Survivor Insights 67: Who’ll Win Survivor Heroes vs Villains? COLBY: If he makes it to the end, he wins. Too many heroes on the jury that have too much animosity for the Villains. Despite not earning it, Colby could soon be a millionaire. SANDRA: She has to make it to the end with Russell and/or Parvati to have any chance. Jerri and Colby will both beat her. PARVATI: Could become the first two-timer winner. She’s that good and has played that good of a game. RUSSELL: Could become first time back-to-back loser. He’s that good and that despised. For Russell to win it will take a jury that appreciates great game play and let’s go of the social, which Russell simply doesn’t have. One thing is for sure, he won’t have JT’s vote. Probably won’t have Rupert’s either. JERRI: I think Jerri has a very good shot to win this. If she gets to the final with the right person/people she just might get rewarded for all of her growth and overall pretty decent strategic game play. I have to agree with Probst’s Predictions. It all makes sense and looks like he really knows what he is talking about. No one has gotten so close with the castaways except for Probst. Only this man has witnessed how hungry, broke and how pissed off they are with each other. If there’s anyone who acted a HERO and at the same time a VILLAIN in the show, it was Jeff Probst. 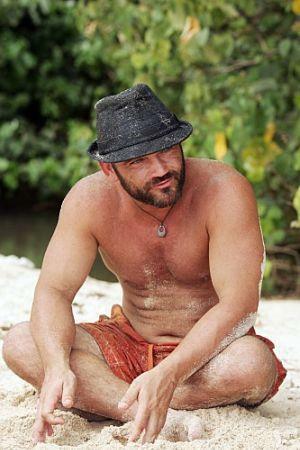 He is the soul and heart of SURVIVOR who manages to put much pressure on each castaway during Reward & Immunity Challenges and Tribal Councils. Parvati won the Immunity Challenge (A repeat of SURVIVOR GABON’s Episode 8 IC and Matty outlasted Bob to win it for his tribe, Fang). Oh Yeah! This is the right time for another celebration, right? This woman continues to amaze me. Parvati was struggling, clearly not in a good shape during her showdown with Rupert, but Parvati always find a way to fight and flirt her way to success. How HOT is that? Jerri tried her very best to win this episode’s reward challenge. Her level of confidence went uphill while teaming up with her sister. This was a sweet triumphed for Jerri and I was certain that by choosing Parvati and Sandra to go with her, Jerri has already shifted her loyalty to the girls. I wanted Russel Hantz to win the reward challenge. I was looking forward seeing his wife get more airtime. I was pretty certain Melanie has a lot of juicy things to say in front of the camera. Yet, that’s fine. Even with a loss, Russel still tried his best to control the group. He sealed a handshake with Rupert and even asking Sandra if she’s with him or against him. That moment was insanely funny! It’s hard to believe that Russel was allowing himself to beg for survival. Colby could not win a challenge. He regularly screams at his elder brother during the reward challenge due to frustration and was the first one out during the immunity challenge. Was this real? Is that the “real” Colby or is it simply a strategy? Survivor Insights 65: Survivor Heroes vs Villains- Unpredictability Happens! The “evil strategist” in Russel Hantz has risen. After two episodes, he’s finally back. He tried his best to win the second immunity challenge to put things in order. The plan was successful. Danielle was voted out, leaving the vulnerable Parvati alone. Danielle, the remaining representative of Season 12 for this season. So, what’s next? Is this it? Parvati will go next before the finale? But you know what, I don’t think Russel made a smart move by siding with Colby and Rupert. 1) First: Colby is the Captain America of SURVIVOR. Rewinding the time, Colby is the big Hero of Australian Outback of Ogakor Tribe and the biggest threat in All-Stars. This season, we have seen the other side of Colby. The tired one who could not win an immunity challenge. Russel is nuts when he still choose to go head-to-head against him in the finals. That’s crazy. The jury will be on Colby’s side for sure. 3) Third: Parvati might choose to stay in the shade. The mere fact that she played competitively in the challenges, she still has cards to pass on. I don’t know what it is. It seems like a surprise. You see, Parvati was playing a ‘very’ risky game this season. If not for Russel, she went home in the third episode, right? Will I still see her in the finale? Here’s a thought: If Russel-Parvati “couple” arguments couldn’t be fix, Parv might hunt for another ‘alliance’ where she feels comfortable. Perhaps, with Sandra. Sandra has the power to save her but do you really think that will happen? While writing this post, I don’t see it coming. There are only six of them in the camp and Sandra might not want to waste her chances by taking the idol out from her pocket and give it to the queen. But there’s still hope. Perhaps, I will be wrong. Parvati can protect Sandra and advance farther (I wish that happens, if not, end of the line). Sandra needs Parvati. That way, I won’t be surprise if these two will work together to oust the remaining Heroes or, oust Russel? The finale is near. It’s just a question of: Who’s hungrier than the other?